This flyby will give us the first close-up view of an Oort cloud comet, and even better, Siding Spring is freshly picked. It has never before entered the warmer climate of the inner solar system and therefore its pristine icy composition is believed to date from the very beginning of the solar system's formation. It is like a time capsule dating from 4.6 billion years ago. By understanding the amount of water and organic molecules available at the time of the Earth's formation, scientists hope to gain insights into how life on Earth may have first developed. 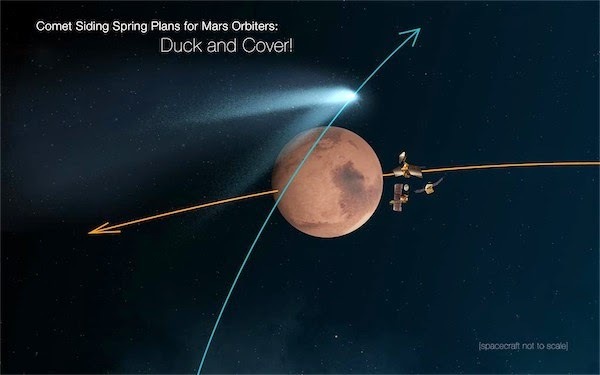 Already NASA has repositioned its Mars orbiters — Mars Reconnaissance Orbiter, Mars Odyssey, and MAVEN — in a 'duck and cover' maneuver to avoid hazardous comet debris with velocities of 35 miles per second. This amounts to moving the satellites behind the Red Planet relative to the comet's approach. 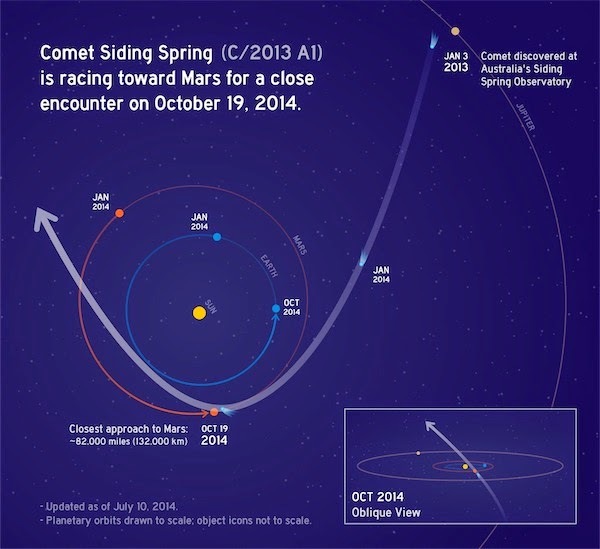 A direct collision between the comet and Mars or its spacecraft is considered unlikely. Last week NASA outlined the suite of spacecraft, both satellite and ground-based, that they will use to study the comet. Their goal is to closely image the comet nucleus and determine its composition and observe how it interacts with the Martian atmosphere. Today, the newcomer on the Martian block, MAVEN, starts photographing Siding Spring as it approaches, with the aim of learning more about how comets disintegrate in the solar wind. During closest approach, the Mars Reconnaissance Orbiter will image the comet's nucleus including any surface variation as it flies overhead, aided by Mars Odyssey and MAVEN. On the ground, the rovers Curiosity and Opportunity will photograph the comet's general features and mineral content. Martian spacecraft will certainly have the best view of Siding Spring. Earth-based observers will need a 8-inch telescope or larger and a clear view of the southwestern horizon over the weekend in order to glimpse the elusive comet, according to Universe Today. This close encounter is but the prequel leading up to the Rosetta mission's historic landing on a comet on the 12th November. If you have not yet seen the amazing images coming from Rosetta, now only 10 km away from the surface of comet Churyumov–Gerasimenko, you are in for a treat. Comets have never before been so accessible or so stunning. You can follow Siding Spring's progress via NASA's dedicated webpage.